500 years ago, a half-million people vanished in space. Now their descendants have been found. What cultures have evolved in half a millenium? What alien works and ways have been discovered? What will the lost children of Earth think of the Universe that is now open for them? 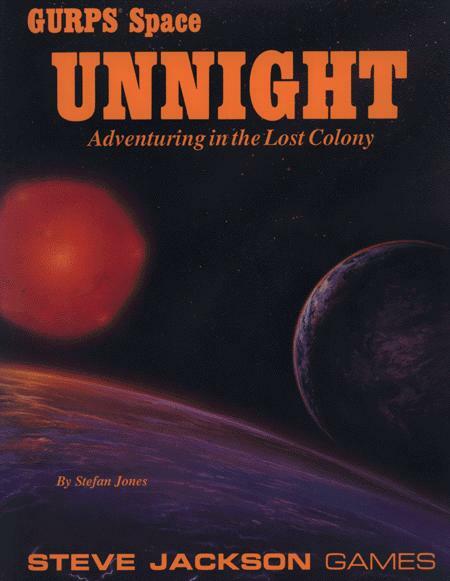 A planetary record sheet for the world of Unnight, and information on its strange animals and plants. Data on Unnight's sun Stuzak, its anomalous satellite Orb, and the rest of the Stuzak system. The nations and cultures man has built on this new world . . . including the flying Hawk Lords and the secretive "Wizards." "First Contact," an Unnight adventure. GURPS Space – The ultimate toolkit for any GURPS Third Edition campaign between the stars. GURPS Space: Stardemon – Visit the old-fashioned planet of Anson. GURPS Space: Terradyne – Glimpse the future of our own solar system!